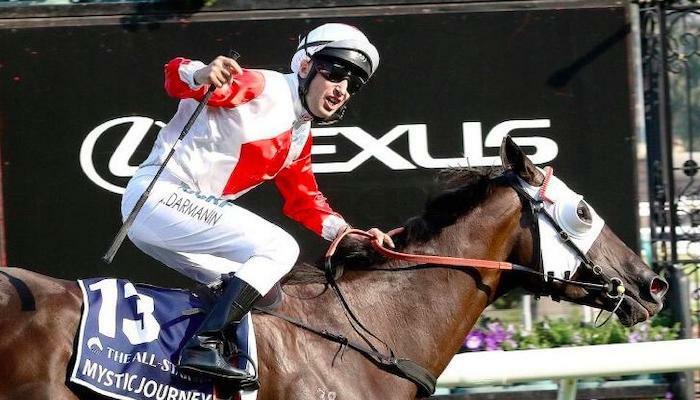 Adam Trinders star became Australias inaugural All-Star Mile champion when MYSTIC JOURNEY blew her rivals away in the $5 million Flemington mile, capping a superb preparation and now on target to the Cox Plate in the Spring! It was also a remarkable performance from Ron Quinton who won yet another Coolmore Classic, this time with DIXIE BLOSSOMS who became a very well deserved Group 1 winner. The big wins didnt stop there at Rosehill when COSMIC FORCE stormed into Golden Slipper calculations with a massive seven length win in the Pago Pago for Snowden Racing. While the Kris Lees and Australian Bloodstock team really have RED CARDINAL flying, going back-to-back to win the Sky Highs Stakes under Kerrin McEvoy. Back at Headquarters, and the day started in great fashion for Pat Carey when in the Makybe Diva silks SWIFT SIS scored well at 18/1 over 1200 metres. Canberra visitor Matthew Dale also took the bookies to the cleaners after new stable recruit PROMETHEUS showed his promise in the Grand Handicap Mile. Punters Pal WIDGEE TURF however proved a popular winner with a well timed run to win an incredible 10th win from just 27 starts for Patrick Payne. The Parnham Racing team had a good day out with a double at Ascot thanks to Chris riding YEAH BRAVO to victory with a box seat ride and Steven getting the job done aboard PLATOON in the Listed JC Roberts Stakes. Mick Price Racing claimed an amazing win with READY SET SAIL and Gollan Racing scored a double with ALL PLUCK and MCKINLAY MISS. A shout out to Kelly Schweida on the victory of the smart THE ODYSSEY to lead all the way in heavy conditions at the Gold Coast while in more humid weather, TACITURN and THE CAPTAIN gave Gary Clarke a double in Darwin. While enjoying the All-Star Mile build-up with Balfs Choice, Ryan Balfour also enjoyed success back home when VIDUKA went undefeated from two starts in the opening race for Cory Parish. Congratulations to all our overseas winning trainers; G & G Richardson and Parker in New Zealand, Stephen Gray and Dan Meagher in Singapore and Glen Kotzen and Adam Marcus in South Africa.